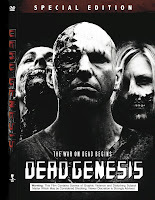 Win a copy of DEAD GENESIS on DVD from Shattered Ravings! 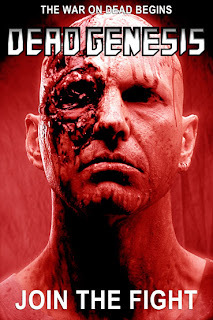 4H Contributing writer Scott Baker recently reviewed an independent zombie film called DEAD GENESIS. You can read his review here. Not only did he review it, but now he is giving away a copy of the DVD to a lucky reader of his Shattered Ravings blog! Entering is easy, and the contest ends July 14th at midnight. Hurry and enter today!! 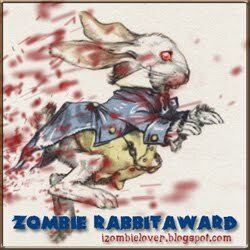 CLICK HERE to go to the DEAD GENESIS contest post on the Shattered Ravings Blog site. June 29, 2012, New York, NY - Greetings from Tromaville! free, to show gratitude for their 40 years of support. Announcing the winner of the autographed SPIRIT CAMP DVD!! Congratulations to Eric King, winner of the latest 4H Blog Giveway!! Eric runs a cool Robocop themed sci/fi blog...click HERE to visit his blog. Eric will be receiving the autographed copy of SPIRIT CAMP on DVD! Don't worry if you didn't win...you can get your own copy by clicking below. This is a must have for horror fans!! Full Moon Features recently released a group of films they call the FULL MOON'S GRINDHOUSE COLLECTION. This is a great group of films, some of which have never been available on DVD before! Tonight's review is for one of the films from the Full Moon Grindhouse collection called, FILMGORE. FILMGORE is a compilation feature. It is hosted by the one and only Elvira ,Cassandra Peterson, and features some of the most famous scenese from a number of classic well known (and some not so well known) horror films from the past. 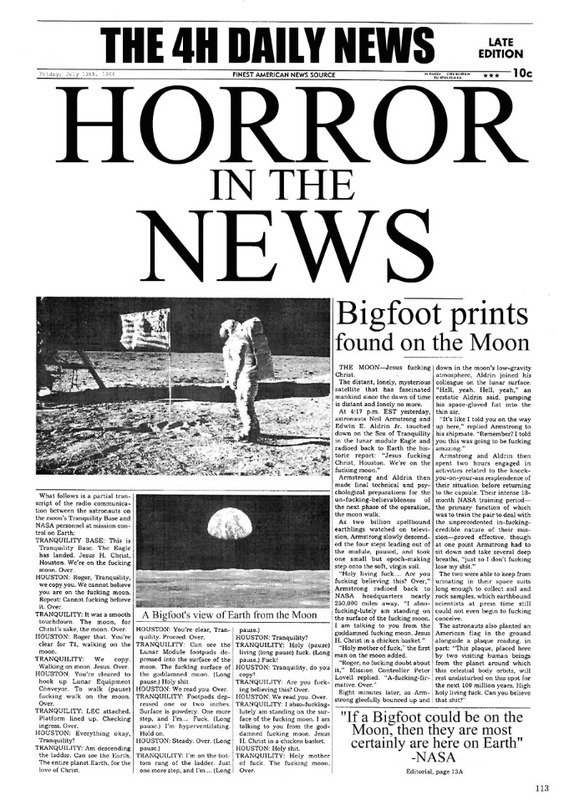 Some of the films featured are THE TEXAS CHAINSAW MASSACRE, SNUFF, BLOOD FEAST, DRILLER KILLER, 2000 MANIACS, and more! Throughout the film, you get introductions to each featured movie by Elvira, the Mistress of the Dark. Elvira is known for her one-liners and puns, and they (along with her ample cleavage) are on disply here for sure. Some are pretty funny, but some are so bad it's a PUN-ishment to have to sit through them! Ha! This is a fun film showcasing some of the best scenes from these horror films, without having to sit through all the complete movies. 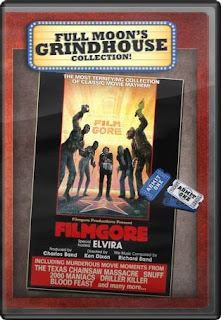 Most true horror fans will already have most of the films featured in FILMGORE, but it is still fun to have all the "greatest hits" on one DVD, and it is great to see Elvira in her prime. The Full Moon Features Grindhouse collection contains 10 different DVD's, and they are all priced at only $10 each over at the Full Moon website! These are some great DVD's to add to your collection at a great price! It's your last chance to enter my latest DVD giveaway!! The FREE autographed copy of SPIRIT CAMP on DVD will be given out tomorrow, 6/27! If you haven't already entered to win, go do so now! All you have to do is leave a comment on the original giveaway post...it's that easy!! I love finding cheap stuff. Not cheap as in poorly made, but stuff that is on sale for a fraction of what it cost when it first came out or when it was new. I especially love finding cheap stuff when it is horror related, so I was on cloud nine while browsing the $2.99 Clearance Books at my local Hastings Entertainment store and running across this beautiful book! 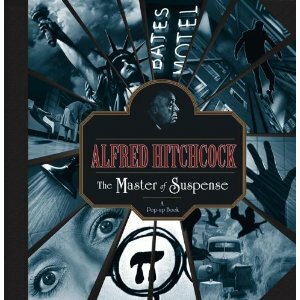 It's the ALFRED HITCHCOCK: THE MASTER OF SUSPENSE: A POP-UP BOOK by Kees Moerbeek. This is a beautiful hardcover pop-up book which features pop-ups of some of the most famous scenes from some of Hitchcock's most well known films, including: Saboteur, Vertigo, Psycho, The Birds, Marnie, Torn Curtain, and Frenzy. For a look inside the book, check out this cool You Tube video I found, where you can see every pop-up from the book! This is a must have for Hitchcock fans. The book came out back in 2006, so you might not be able to find it at your local bookstore, but it is readily available on-line, and can even be found used for less than $10 from some sellers! Here are some links to help you if you wish to purchase this book. Check them all to see who has the cheapest used price at the time. I recently came across the trailer for REPORT 51, or R51 as it is also known, while browsing trailers on You Tube. I knew nothing about this film and haven't heard anything about it which seems strange to me, as this trailer looks really cool. 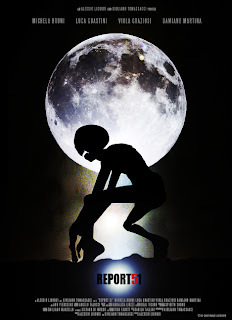 It is a another entry into the "found footage" sub-genre, which I know is being a little over done, but don't let that keep you from giving this one a chance. I think based on this trailer that REPORT 51 could be a great film. I haven't found any release dates or DVD release info, so I'm not sure when we will be able to check out the full film, but until then, check out the trailer by clicking below and let me know what you think! If you have not seen PROMETHEUS in theaters yet, I suggest you do so asap! It was one of the most enjoyable films I have seen in a long time and has found it's place as one of my favorite Sci-fi films of all time! I am not the biggest Sci-fi fan (you all know my favorite genre), but I thought this film was amazing. Like the film, PROMETHEUS: THE ART OF THE FILM by Mark Salisbury is also amazing. The book is published by Titan Books, who are known for producing some of the best movie tie in books around, and after one look at this book, I have no doubt you will agree. As the only book to directly tie in to the film, this lavish title serves as an exclusive guide to the never-before-seen content, including newly revealed production art, exclusive interviews, extraordinary behind-the-scenes material and an introduction by legendary director Ridley Scott. PROMETHEUS: THE ART OF THE FILM is a beautiful hardback book containing 192 pages and too-many-to-count color photos. This is a true "coffee table" book, with dimensions of 11 3/4in x 9in. This is one book you will definitely want to show off. A written review of this film is probably unfair to the book. Words can not describe how good this book looks. The pictures are amazing and every aspect of the film is represented in beautiful full color pictures. The book is broken down into chapters that describe all the stunning props, sets, and creatures of the film. Along with all the beautiful color photos, there is a remarkable set of black and white photos documenting the disintegration of the Engineer from the opening scene of the film. The opening of the film is brilliant and it is neat seeing it broken down in pictures. While the main spaceship, The Prometheus, gets a lot of attention in the book, all the smaller vehicles are described in text and in photos as well. We also get great descriptions of all the costumes and space suits and even a great look inside the pyramid including one of my personal faves, some photos depicting the construction of the giant Engineer head statue. As mentioned in the book's description above, along with all the great photos is a lot of production art. This include some paintings, but mainly lots of drawings and sketches about how something is supposed to look. It is very interesting to see what the set designers drew and how the actual finished product looks. This is in my opinion, one of the greatest movie tie in books off all time. It is a must have for fans of this film, and if you weren't sure if you wanted to see the film or not, I bet you will definitely want to see it after looking through these gorgeous photos and all the great info from the film. 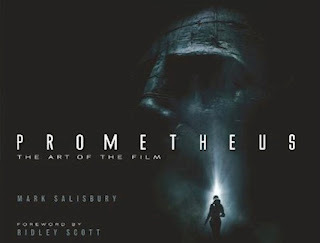 PROMETHEUS: THE ART OF THE FILM is available now from Titan Books! Ok, I know I am a little behind here. Most all of you by now have seen the awesome trailer for the upcoming film, V/H/S. If you haven't seen it yet, where have you been? If you have seen it already, well then you know it is worth watching again! V/H/S premieres On Demand starting August 31st and will be in theaters on October 5, 2012. I'm not sure what kind of theatrical release this is going to get....hopefully it will not just be a limited release as I would love to check this on out in the theater! THOU SHALT NOT KILL...EXCEPT is one of those rare gems, a film a lot of people have probably never seen, and probably never even heard of. Hopefully that will change with Synapse's awesome new release. The back of the Blu-ray box states that "this film features many of the people responsible for the EVIL DEAD films, including co-writer Bruce Campbell, writer/producer Scott Spiegel, composer Joseph LoDuca, and actor Ted Raimi". If that isn't enough to get you interested, than I don't know what is! Now get me wrong, this film is no EVIL DEAD, but then , most movies aren't in my opinion. It is a very good film, though, and one worthy of adding to your DVD/Blu-ray library. There is some pretty good gore throughout the film, and some very memorable scenes....one that stands out in my mind is a scene where the evil cult has the sheriff tied to a tree and they are playing lawn darts with him as the target! * The Original Super 8mm Short film, STRYKER’S WAR Short Film, starring Bruce Campbell! Horror in the News: 63 Year Old Woman Becomes Pregnant With Baby Squid!! Ok, I know that sounds like a headline from THE WEEKLY WORLD NEWS or some other check-out line tabloid, but this is actually true!! Well, sort of anyway. Ok, so SHE didn't actually become pregnant with a baby squid, but her mouth was "impregnated" with a baby squid. Confusing, well, read the article from the UK's Daily Mail website. Here is a portion of the article, with a link at the end to the full article should you desire to read more! This story was also reported on the International Business Times website. There is a link to both articles at the bottom of this post. A 63-year-old woman became 'pregnant' with 12 baby squid after eating calamari, according to a claim in a bio-tech report. The real-life 'octo-mum', from South Korea, was eating a portion of cooked whole squid when she felt a sharp pain in her mouth. The lady told doctors that she could feel something in her mouth which they described as 'bug-like organisms'. When examined, the doctors found 'baby cephalopods' attached to her mouth. These are small pods, covered in a cement-like material to make them stick. Inside the pods is an 'ejaculatory apparatus' and sperm - with the apparatus expelling the sperm quite forcefully. 'Twelve small, white spindle-shaped, bug-like organisms stuck in the mucous membrane of the tongue, cheek, and gingiva [gums] were completely removed, along with the affected mucosa. 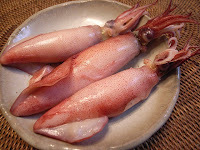 Ok, so the moral of the story is to never eat squid with the organs still in it...cook it until it is well done, and by all means, dont' eat male squid! For those wondering, the article does go on to say that she did not swallow. Sorry, couldn't resist. or CLICK HERE to read the article from International Business Times website. 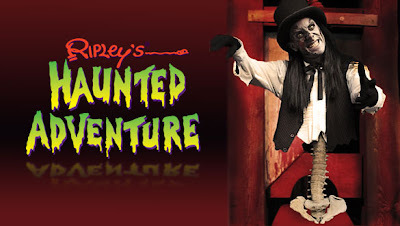 Haunted House Spotlight: Ripley's Haunted Adventure !! Any time I go on vacation, I am always on the lookout for anything horror related. Last week while in San Antonio, Texas with my family on vacation, I spotted the RIPLEY'S HAUNTED ADVENTURE! Open year round, this Haunted House was a step above what I imagined it would be, and they even turn the scares down a notch in the summer (more on that in a minute). RIPLEY'S HAUNTED ADVENTURE is very easy to find, as it is directly across the street from the Alamo. If you are going to San Antonio, you are more than likely headed to the Alamo, so step across the street and try this out....if you dare!! From the moment you step up and meet "Stumpy", you know you are in for a treat! He is named that due to the fact that he is only a half torso man with a no legs! He is a funny carnival type "barker" who is out by the street and interacts with the crowds. 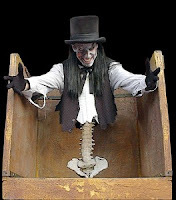 Once you purchase your ticket, your adventure starts as you are loaded in a old coffin lifting elevator (the theme of the haunted house is an old coffin company). The slanted elevator takes you to the top floor where you are let out and met by your tour guide, and then he sends you off on your "tour" of the factory. You will encounter a number of disturbing things, including a mental patient who wants your help to escape, a room you have to walk through full body bags hanging from the ceiling filled with dead bodies (or are they? ), a man being sawed in half, and even a plank you have to walk across with a drop-off on both sides! These are just a fraction of the scares you will find inside the Ripley's haunted house. Earlier I mentioned that they turn back the scares a bit in the Summer. I talked with the manager a bit before I went in and told him I was planning on doing a review for my horror blog. He warned me before I went in to not be disappointed, as they tone down the scares in the summer due to the tourists that come through with smaller kids and also the expense. You see, in October, closer to Halloween, RIPLEY'S HAUNTED ADVENTURE is transformed into what sounds like the scariest place on earth, with almost 40 live actors and increased make up and prosthetics. But I must tell you, if this was toned down when I went through, I'm not sure I could handle it in October! I like to think I don't scare easily, but I can't count the number of times I literally jumped as I went through this old coffin factory. You never know when a secret door or window is going to open with a screaming ghoul behind it! The scare factor was high I thought, I can't imaging what this place would be like in October, but I would love to check it out someday. If you find yourself in or near San Antonio, check this place out for sure, especially if you are there near Halloween time. RIPLEY'S HAUNTED ADVENTURE is located at 329 Alamo Plaza, directly across from the Alamo, and is surrounded by other great attractions such as the Guinness World Records Museum and the Tomb Rider 3D Adventure Ride! I posted the trailer for MONSTER BRAWL almost a year ago (see that post here) and stated that this was either going to be the coolest movie ever, or the worst movie ever. I got a chance to watch the film and I am happy to report that it by no means falls into the "worst movie ever category". Unfortunately, it doesn't fall into the "coolest movie ever" category either, but come on, that is a pretty bold statement....you can't really expect it to qualify for that kind of accolade! But...even if it is not the coolest move ever, it was still a very cool film and was a lot of fun. Welcome to the world of MONSTER BRAWL, the award-winning monster mash-up and undeniable crowd pleaser of this year's film fest circuit. 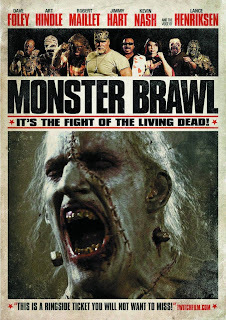 MONSTER BRAWL features an all-star cast of classic monsters, beloved horror icons, and wrestling royalty in what is being called "the undisputed smack-down hit of this year's bumper crop of comedy horror!" First off, I have to state that this movie is filmed very well and looks great. The film stars former wresting veterans, Jimmy "Mouth of the South" Hart and Kevin Nash. The acting is so so, but that really doesn't matter, because everyone knows the reason you wanna watch this movie is for the fighting monsters!! The film is filmed in the style of a pay-per-view boxing or wresting event. The monsters are divided into classes and pitted against each other in a tournament to decide who is the greatest monster of all! Each monster, after being introduced, is given a feature that gives a little back story of the monster including the monster's origins. I found this to be my personal favorite part of the film. The fighting scenes are pretty good and really, that's about it. There is not much in term of plot for this film, but there really doesn't need to be. It's a movie about monsters fighting and that is just what you get! Overall, I thoroughly enjoyed MONSTER BRAWL and would recommend it. I have to admit I really enjoyed seeing Jimmy "Mouth of the South" Hart in this film! He was always one of my favorite personalities in the WWF when I used to watch it as a kid, I swear he looks and sounds exactly the same as he did back then! I don't think that dude ages at all! 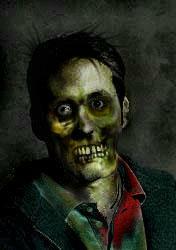 As most of you know, I am a huge zombie fan. 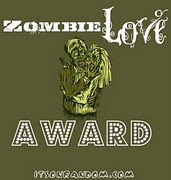 In fact, zombie movies are my favorite horror sub-genre. I love all zombie films, whether it is the big budget films or the small, independent, low budget ones....if it deals with zombies, I'm gonna check it out. Well, I ran across a film the other day called DEAD GENESIS. The trailer looks really good for a low budget zombie flick. Check out the trailer by clicking the link below and let me now what you think. I will have a full review of the film posted soon once I get a chance to watch it, so check back soon for that! 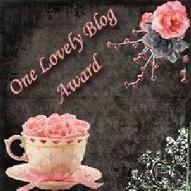 Enter to win the latest 4H Blog giveaway! An AUTOGRAPHED DVD of SPIRT CAMP!! I promised you when I got back from vacation I would do another DVD giveaway, and I am a man of my word!! This is not just any DVD giveaway, this is for a signed copy of the great independent horror/comedy film, SPIRIT CAMP!! I reviewed SPIRIT CAMP a couple of years ago, you can read that review HERE. I am a HUGE fan of of this great film, and want as many people as possible to see it, so when I saw Kerry and John this year at Texas Frightmare Weekend, I got them to sign a DVD just for the readers of this blog! They are great guys and were happy to give this DVD to one lucky reader of the 4H Blog! Read below for the rules and instructions on how to win this great DVD! The DVD is signed by writer/director/executive producer Kerry Beyer and producer John Lansch! 4. Contest is scheduled to end on Wednesday, June 27th, 2012. 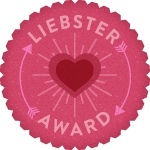 Comments must be left by the end of the day on 6/27 in order to count towards the contest. Ok, not back from the dead as the pic might suggest, but I am back from Summer vacation! 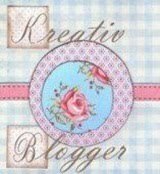 Daily blog posts will begin again immediately! Thanks! The 4H Blog is taking a short summer vacation starting tomorrow, 6/2, so there will be no new posts for about a week. I am taking a much needed break from the blog to do some traveling, and just hang out and do some some fun summer activities with the family around home. 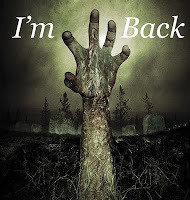 I will be back with regular posts starting next weekend (around the 9th or 10th), and when I come back expect some cool stuff like a brand new DVD giveaway!! Until then, check out the archives section on the right to see a bunch of older 4H posts you may have missed! Have a great weekend and a great week next week! !